One of the Point Loma High Student addresses the San Diego School Board. On March 24th, the San Diego Unified School Board voted unanimously 5-0 to “encourage Sea World to explore animal sanctuaries for their animal entertainers”. The resolution was sponsored by Trustees Kevin Beiser and Richard Barrera. 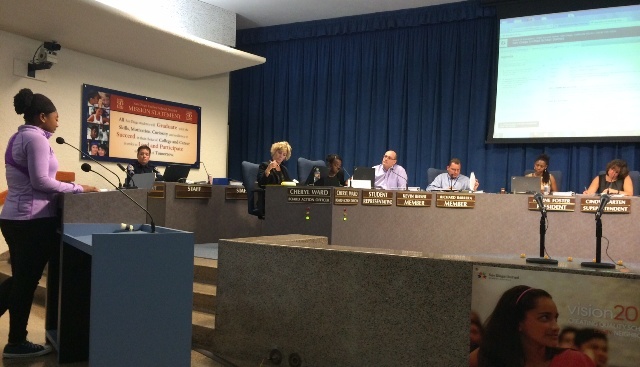 The Board had been petitioned by local students – including some from Point Loma High School -. See the full resolution . Students praised the San Diego Zoo and Safari Park for its commitment to education that doesn’t require animals forced into entertainment and noted the recent decision of Ringling Brothers to discontinue its trademark elephant acts. The students’ speeches were well researched and highlighted their individual experiences with animals. Some mentioned how as children they loved seeing orcas and dolphins at SeaWorld, but as they learned how marine animals suffer in captivity realized there were better ways to learn about wildlife. They encouraged SeaWorld San Diego to discontinue the use of animals as entertainment and follow suit of similar organizations. SDUSD is the second largest school district in California and governs the birthplace of Sea World 51years ago. This marks an important moment in humane advocacy, setting a precedent for the humane treatment of animals on top of higher educational standards. Students who spoke in favor of the resolution were also from Poway. That is exactly what four sixteen-year-old juniors from the Cinematic Arts Program at PLHS did on behalf of the voiceless Tuesday night at a SDUSD School Board Meeting. But not only did these students speak on behalf of a resolution proposed by School Board Members Kevin Beiser and Richard Barrera asking SeaWorld to Explore Animal Sanctuaries their opposition was none other then SeaWorld San Diego President John T. Reilly and two-dozen staff members of the park and their families. I am proud to say although my students were greatly outnumbered they were victorious in securing a controversial unanimous vote on a resolution Supporting Educational Opportunities for Students on the Human Treatment of Animals. This resolution comes on the heels of Ringling Brothers and Barnum and Bailey Circus announcing their plan to phase out Elephant Acts over the next few years. The question is will the SDUSD Resolution proposed by Kevin Beiser and Richard Barrera and unanimously passed by the School Board help influence SeaWorld to do the same for their Animal Acts? The students from my class think so! If you want a chance to interview them you have two days before they go on Spring Break. My student speakers also recently released their latest video “Dear Ringling Brothers”, the link is below. I believe SD Unified Schools District, touting itself as the second largest school district should encourage its students to take a more active role in studying, aptitude/achievement, student and school violence, teenage pregnancy, sexting, bullying,behaviorial and goal building and objectives, and higher education before their involvement and critcism in a corporation/organization that assists in saving animal lives, education and has been a landmark in San Diego and Florida for years. When an overwhelming percentage of your SDUSD students can’t grasp fundamental English and grammar, spelling and poor diction and the inabilities to graduate with standard learning skills, obesity and bullying ; SDUSD your efforts and student body energies are directed in the wrong arena in their vigilant stance taken against SEA WORLD. While enlisting their efforts to criticize certain groups, nary mentioned races horses at DEL MAR race tracks, abused animals taken to shelters for treatment perpetrated by students in the second largest school district. Drop the politics. WE PAY you to perform. What makes you think that these students who are showing that they have developed a keen sense of morality and ethics regarding other species do not also have the academic skills in all the areas you mentioned? And as for bullying, SeaWorld bullies every person and group who points out their cruelty towards whales and other animals. The company doesn’t display an ounce of ethics. These children DO. I don’t even live in San Diego and I am proud of them. Your taxes may pay your school district to perform, but guess what? NO ONE pays the whales to perform. They live lives of slavery for SeaWorld’s profit. These children are heroes for standing up to SeaWorld and so is the school district. May this happen in Texas and Florida too. Elaine, teaching compassion and letting people get behind an issue they care greatly about will help almost all of those issues in time. The adolescent mind works a little differently and choosing the issue that is important to the students and let them work with that prevents apathy. Teaching students that they can make a change with their research and compassion will open their eyes to other issues. Since you care about the other issues you mention I hope you are doing something to improve them as they are indeed important. Telling students to not try to help animals is only going to make them confused and feel like it’s not important when compassion is extremely important whether it’s for animals or humans. Choosing one issue does not negate the others. Renee, Absolutely madam I support many causes. Not just the ones of notoriety for todays’ media. I was born and raised in Alabama during the 50’s. I know injustice and maltreatment first hand. I saw my grandparents in the cotton fields; my father and uncles gravely ill from asbestos lung cancer working in steel mills in Holt and Tuscaloosa, Alabama and died horrific, agonizing deaths. I have stood fast, frighten to death against KKK marches. I was there in renouncing the 53rd District Klansman who ran for office here in the 80’s. I was there at KIT Carson Park in Escondido when their ceremonial displays of hate were displayed. I was also in Delano, Riverside Counties in sync with hundreds of others when children in cancer clusters were dying due to the pesticides being used in the agricultural fields by wealthy farmers; their parents worked daily in these fields daily – sunrise to sunset. Most folks didn’t careaslong as they got there veggies, fruits daily at the expense of these cancer causing agents. We stoodfast, rallied weekly in bus loads in these communities until we saw change. This is my legacy madam. And going forth, my campaign against cruelty period; not just when it strikes me to support a cause. What I do support are the rescue efforts of animals left and abandoned to starve to death when the owners no longer can afford to feed, and care for them. What I do support are the elderly left to die alone in hospices, and SNFs because their families no longer have time for them. What I do support is when our law enforcement(s )are thrown underneath the bus when trying to keep us safe. These and others are my causes madam. My entire life has been supporting and walking that walk; not just something because of its popularity today. Perhaps, the students may wish to take home and care for the baby sea lions washing ashore on the beaches,sidewalks and starving since Sea World is such a horrible place in their tender minds. My comments about the kids platforms regarding Sea World, and their cause; hopefully will evoke awareness in areas which are equally tantamount to other worthy causes, which I’m sure many bear witness to on an equally endearing daily basis — their classmates. Renee ,in what I see daily in our youth; the biggest failures in our youth are the failings of our youth. When these students can cite every lyric in Beyonce, Taylor Swifts, Rihanna, Lord, Adele, etc. songs but can’t name the capitals of our 50 states; let alone the 50 states..there is a concern. Thank you, I’m not a bystander and never have. My causes have been and still are worthy. These young people are awesome. Showing compassion and caring for something else beyond themselves is praiseworthy. For over 50 years SeaWorld has been spoon feeding us it’s propaganda. Finally people have woken up to the fact that this corporation only has it’s financial interests in my mind by keeping whales in those tiny, concrete tanks.